There's nothing like a three-week tour of South America with German thrash kings Kreator to psych a band up to create and destroy. Just ask Gary Holt, guitarist and songwriter for San Francisco thrash veterans Exodus. "Playing down there Kreator was amazing. Those kids are totally insane," Holt told Noisecreep. "They were some of the most violent crowds we've ever seen. It was definitely a good way to finish up before starting a new album." "I was a little bit under the gun, but sometimes that's good," Holt said. "If I was allowed to be too comfortable, I don't think the songs would have enough frenetic energy. It's all about stress." Exodus started tracking drums at Sharkbite Studios in Oakland with producer Andy Sneap (Megadeth, Kreator, Arch Enemy) on Nov. 21, 2009, and a week later the group moved up north to the a three-story vacation home near the Russian River to record the rest of the music. "We were there for three weeks," Holt said. "It's nice to do that and get away from the usual commute and recording studio environment and just live and record." Holt says 'Exhibit B: The Human Condition,' which comes out May 18, features "some of the best songs we've ever done," and adds that the material feels like a combination of the highpoints of the band's last three records. 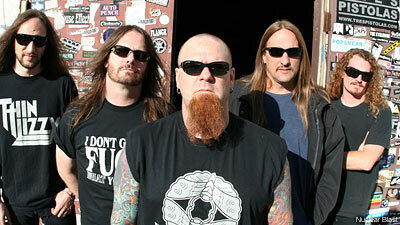 "All of our last three albums have all been 100 percent Exodus but they've all been different," he said. [2004's] "Tempo of the Damned' was a bit more old schoolish, [2005's] 'Shovel Headed Kill Machine' was super-aggressive and grindy and gnarly and fast and 'Exhibit A' was dark and epic and huge. This one is different once again but it has elements of all of them. It's It's really fast and heavy and there's a bit more dual guitar stuff 'cause Lee and I have been playing together a lot longer now. We're all really happy with it."